The 100 metres debuted in 1928 in Amsterdam and Betty Robinson, a 16-year- old high school girl, won in a world record-equalling 12.2. She had only started running in March that year and in her second race and first outdoor race she had broken the world record! A plane crash three years later, which left her unconscious for seven weeks, caused a knee injury which meant she couldn’t do sprint starts and could only run relays and she won a 4x100m gold in 1936. Polish-born Stanislawa Walasiewicz, who was the first athlete to break 11 seconds for 100 yards, grew up in the USA but chose to compete for Poland in Los Angeles in 1932. She equalled the world record in all three of her races and won narrowly in 11.9 from Canadian Hilda Strike who shared the world record time. When the Pole was 80 – and now known as Stella Walsh – she was shot dead in the USA with the autopsy revealing by current rules she was a man. She won silver in 1936 in Berlin, beaten by world record-holder Helen Stephens. Stephens bettered her 11.6 world record in all three races but all of them were wind assisted. She won the final in 11.5. In 1948 in London the 200m was introduced into the Games and Fanny Blankers-Koen won a sprint double in 11.9 and 24.4 winning both races easily. Marjorie Jackson was equally dominant in Helsinki in 1952, equalling the 100m world record with 11.5 and 23.7 200m. In the semi-finals, she had broken the world record with a 23.4. There was another Australian double in Melbourne in 1956 with Liz Cuthbert winning with times of 11.5 and 23.4. All three medallists were in the same order in both events. Wilma Rudolph, the 20th of her father’s 22 children, repeated the sprint double in Rome in 1960. The American equalled the world record of 11.3 in her semi and then ran a startling 11.0 with an illegal 2.7m/ sec wind. In the 200m, she ran an Olympic record of 23.2 in her heat but conditions were poor in the final where she clocked just 24.0. Wyomia Tyus won the Tokyo 100m in 1964 in 11.4 after a world record equalling 11.2 heat. She didn’t contest the 200m final won by team-mate and silver medallist Edith McGuire in an Olympic record 23.0. However, she still achieved a unique double as she retained the 100m title in Mexico in a world record 11.08. Irena Szewinska, who was third in the 100m, won the 200m to go one better than 1964 in a world record 22.58. The Pole was third in 1972 to complete her 200m medal set as gold went to Renate Stecher. The East German broke the world record with 11.07 in her 100m and equalled the 200m with 22.40. Between 1970 and 1974, Stecher achieved a 90-race outdoor winning streak at 100m and 200m. Stecher won two medals in Montreal 1976 but was beaten by Annegret Richter’s 11.08 and Barbel Eckert’s 23.37. East German Eckert defended her title in Moscow in 1980 with an Olympic record 22.03 in Moscow after Lyudmila Kondratyeva surprised at 100m. Evelyn Ashford, fifth in 1976 but absent due to the boycott in 1980, returned as world record-holder in Los Angeles to win easily in 10.97. Valerie Brisco-Hooks, who scored a unique double having won the 400m, improved the Olympic record to 21.81 at 200m. Florence Griffith-Joyner was second in 1984 but looked a different athlete in 1988 at Seoul. She won the 100m by three metres from Ashford in a superb but windy 10.54, while her 10.62 from her heat remains the Olympic record. Her 200m was even more breath-taking. In the semi-finals, she improved Marita Koch’s world record to 21.56 and then destroyed it with a 21.34 final, winning by four metres from Grace Jackson’s 21.72. The races in Barcelona and Atlanta in 1992 and 1996 were more competitive (see most memorable Olympics). In the 200m, Marie Jose Perec, who had won the 400m, was a surprise winner ahead of Merlene Ottey, who had been third in 1980 and 1984. In Sydney in 2000, Marion Jones won a celebrated easy double in 10.75 and 21.84 but was stripped of the titles in 2007 and later jailed for lying to federal prosecutors. The 100m runner-up Ekaterina Thanou, who had drug allegations of her own to deal with in 2004, has not been upgraded to gold. Pauline Davis-Thompson of Bahamas did however get upgraded in the 200m. There was a shock victory in the Athens 100m in 2004 for Belarus’s Yuliya Nesterenko and the bronze medallist there Veronica Campbell won the 200m. 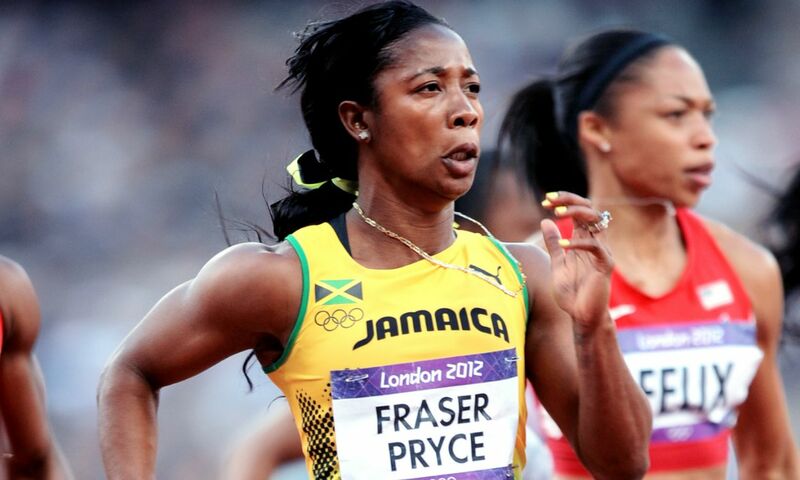 The Jamaican retained her title in 2008, again defeating favourite Felix in the 200m as Shelly-Ann Fraser won the 100m. At London 2012, Felix finally won 200m gold and the now married Fraser-Pryce retained the 100m title but less decisively. The 100m in Spain was notable as just six hundredths of a second covered the top five athletes. Gail Devers was primarily thought of as a hurdler and was eliminated from the hurdles semi-finals in 1988. She then suffered from Graves Disease which cost her two and a half years of training prior to Barcelona. Off to a quick start, Devers battled with Russian Irina Privalova most of the way and edged clear. Juliet Cuthbert, Gwen Torrence and Merlene Ottey all closed on the second half and Devers won in 10.82 from Cuthbert’s 10.83. Privalova won the bronze in 10.84. Torrence ran 10.86 and caused bad feeling among the others by saying two of the top three were on drugs. Ottey ran 10.88 and was only fifth. Torrence did go on to win the 200m in Barcelona from Cuthbert and Ottey in 21.81 after a 21.72 semi-final. Devers beat Ottey and Torrence narrowly again in the Atlanta 100m in 10.94. Both Dorothy Manley at 100m and Audrey Williamson at 200m won distant silvers behind Fanny Blankers-Koen in the 1948 Olympics. In Rome in 1960, Dorothy Hyman won 100m silver and 200m bronze well behind another all-time great, Wilma Rudolph. Only Kathy Smallwood, then later Cook, has come close since finishing fifth in the Moscow 200m in 1980 and fourth in Los Angeles 1984 in a superb 22.10, just 0.01 behind Merlene Ottey.